Presented by Central Arts & BPM Junction. Spotlight: Experience the future of electronic music. The event that gives electronic musicians and music lovers an intimate space, to engage with and enjoy, some of the best and most exciting emerging music and visual productions, from the most talented of producers and DJs. Central Arts and BPM Junction bring you the 5th in a year long showcase of exciting electronic music talent. 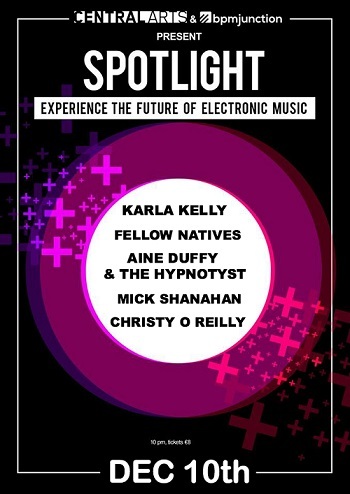 The Line up includes: Karla Kelly, Fellow Natives, Aine Duffy and The Hypnotyst, Mick Shanahan and Christy O’Reilly. This entry was posted on November 21, 2016 by waterfordarts in Demonstration, General, music, Performance and tagged Arts & Entertainment Waterford, Arts and Entertainment, Arts in Waterford, Central Arts, music, Viking Triangle, waterford arts, waterfordarts.com, what's on in waterford, whats on waterford.